Glue has been used since the days of ancient murals and primitive paintings, and continues to be an important material for fixing paint onto the surface in the production of Japanese paintings today. It is made by boiling animal bones, hide, intestines and tendons to extract collagen, a fibrous liquid which is high in protein, and condensing and drying this into a cake. Today, it is produced primarily from ox ingredients but because deer was frequently used in Japan in bygone days, the term shika nikawa (literally, deer glue) remains to this day. Fish glue and rabbit glue (used mainly in tempera paintings) also exist and people around the world have used animals that were readily available in their locations as ingredients. The types used for Japanese paintings include sanzenbon nikawa (strips of hide glue shown on the rear side of the photo), shika nikawa (at the front of the photo), pearl glue, and glue sheets. 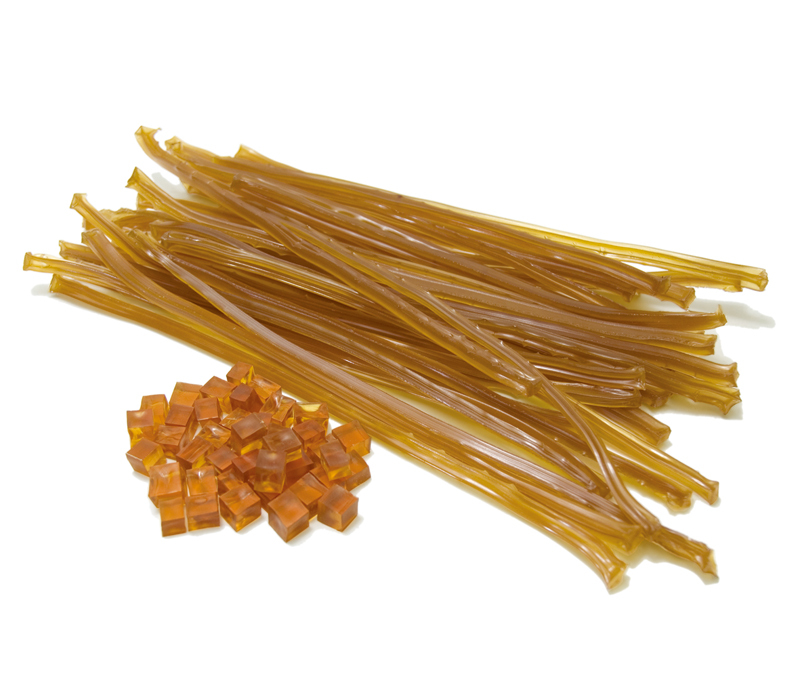 The commonly used sanzenbon nikawa, which literally means 3000-strip glue, is so called because 1 kan (approx. 3.75kg) of the glue liquid will produce 3000 strips of glue. Good quality glue is hard and transparent. There are various ways of using glue. A single type can be used on its own or several types can be blended, whichever works best. Resin glue products which offer strong fixing properties have also been developed in recent years but these cannot be returned to their original state by adding water after they harden so are unsuitable should the user need to remove paint from the surface. The fixing power of glue weakens with age so it is best not to buy glue in large quantities. It should be stored in a well-ventilated, cool and dark place for a short time only. Glue can be purchased at art supply stores that handle Japanese art supplies as well as at general art supply stores.